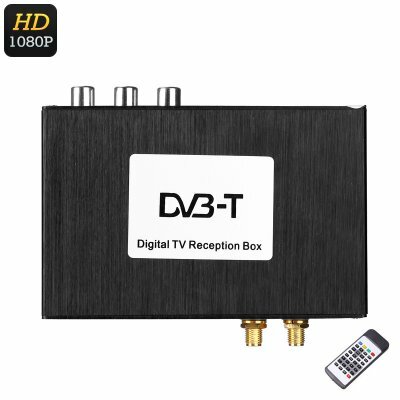 Successfully Added Digital TV Receiver Box - Two Way Video, Multi-Language Subtitle Support, Dual Antenna, 1080p Support, Wide Frequency Range to your Shopping Cart. With this digital TV receiver box for in your car, your passengers will always be able to enjoy movies and digital television while on the road. Simply attach it to your TFT LCD car monitor or car media player and you’ll be able to enjoy all films and series of your liking. This car gadget is perfect for entertaining kids on the road or to upgrade your RV. The next time you’ll head out on holiday abroad, you’ll always be able to enjoy your favorite media. Thanks to its wide frequency range and bandwidth, this car digital TV receiver allows you to access a wide range of media. It comes with two antennas that bring along great connectivity. This ensures that no matter where you’re at, you’ll always be able to watch a movie to kill some time. This car gadget support 1080p media files. Thanks to this, it allows you to watch Full-HD media in stunning detail and vivid color. From now on, your passengers will be able to enjoy a cinematic experience straight from the back of your car. The car digital TV receiver supports both 4:3 and 16:9 aspect ratios. Therefore, you’ll be able to enjoy both classic and wide-screen movies without losing any quality. With its USB port, this car accessory allows you to easily update its software. With its high-speed mobile signal, this digital TV box lets you stream and enjoy media without experiencing any lag. It supports two-way video and audio output to bring along great convenience and usability. You’ll even be allowed to use it with a remote control thanks to which you’ll be able to browse through all its features without ever needing to leave your seat. With its multi-language subtitle support, this car media player provides you with the possibility to enjoy foreign media and movies while spending time abroad. With this car accessory at your disposal, your passenger will never experience boredom again. This digital TV receiver box comes with a 12 months warranty, brought to you by the leader in electronic devices as well as wholesale electronic gadgets..